LOVE this perennial. In July- September it produces electric pink 2″ long fat fluffy tassel like flowers- they fade after a few days to light pink/white for a fine multicolor effect that lasts quite a long time. The pinnate leaves are rounded and handsome and all around this long lived, cold hardy perennial is of regal quality. North Korean collection. 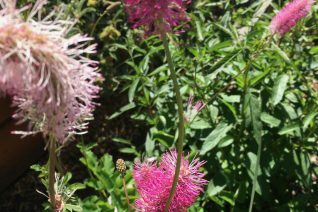 To 30″ tall in bloom by a clump expanding to several feet wide. Rich, moisture retentive soil with regular summer irrigation. The leaves are edible and taste faintly (to me) of cucumber. Excellent perennial. Big, Big, late blooming perennial that is very easy to grow and incredibly showy in bloom. 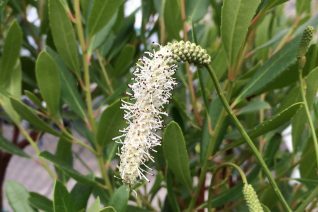 2″ catkin-like white flowers foam 5′-6′ above the plant in August-October. Excellent cut flower, Full sun and rich to average soil that is moisture retentive. Great in the back of a border where it will tower and wave its lovely pure white flowers in the breeze. Full sun leads to much more vertical plants. Regular summer water. Forms spreading patches. Completely winter deciduous. 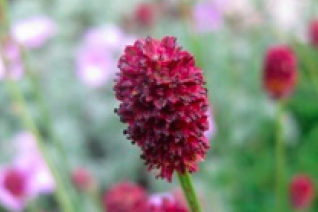 Superb form of Burnet that is compact but supplies masses of deep maroon red lozenge shaped flowers on upright straight stems. The flowers appear from June to October and create a great hazy repetitive texture. Ideal in the front of a border or in a meadow with other plants that do not exceed its compact height. To 12″ tall and forming expanding clumps to several feet wide in time. Rich, moisture retentive soil in full sun is best. Very adaptable to heavy clay soils as long as there is regular summer irrigation. Wonderful combined with the grass Schizachyrium scoparium ‘The Blues’. Regular summer water. Blooms turn russet when they are spent but remain vertical. Leaves turn bright yellow in autumn before the whole plant disappears entirely for winter. Beautiful summer blooming hardy perennial that fits nicely into the new meadow movement. Divided grass green pinnate leaves densely clothe the base of this clumping perennial. 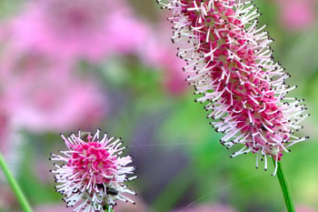 Above the foliage in June- August rise pink furry catkins like blooms on straight stems. The come in profusion and create a light repetitive texture that is ideal with such things as ornamental grasses and other spire perennials like Sidalcea (Checker Mallow). Spent flowers remain until autumn and change to a russet brown. In autumn the foliage turns yellow before disappearing entirely. Completely deciduous in winter. To 18″ tall and as wide in rich soil with regular summer water. Very adaptable to clay soils but requires more regular irrigation. Dried out clay is the worst thing to try and rehydrate. Pretty perennial. Butterfly heaven. Long lived perennial.